This week I was lucky enough to get to chat with American model, Kylie Vonnahme. 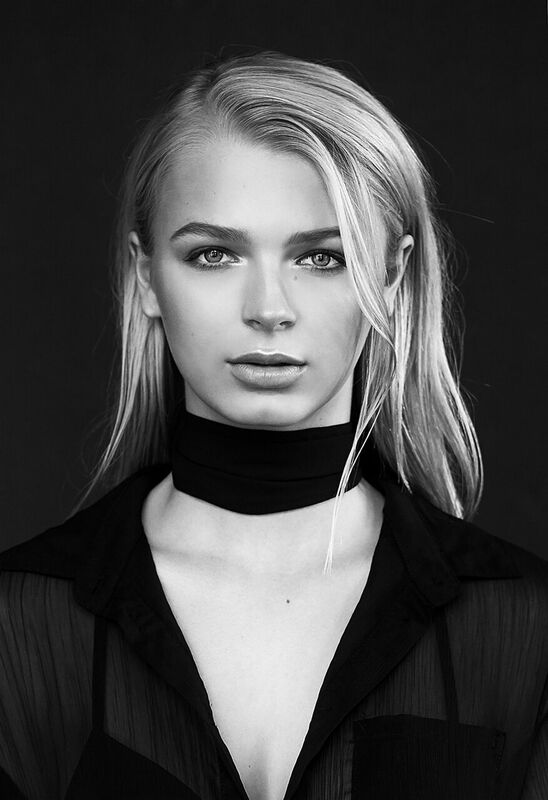 In only 2 years she has gone from being scouted at a Taylor Swift concert in her hometown Dallas, Texas - to living in New York City and being represented by Elite Models, New York City. What is your background? Can you tell us a little bit about that? I am constantly asked if I am Swedish or Russian, and sometimes I am even told that I have a European Accent. I have German in my blood from my dad’s side of the family, and a small amount of Native American on my Mom’s side. I am born and raised in the US, but I do have a bit of mixed ethnicities in my family. I started modeling at 16 years old. I was at a Taylor Swift concert at home in Dallas, Texas and I was approached by a scout from Ford, New York. I was very young and still in High school, but I was quick to sign a 2 year contract just a few days after. Unfortunately, the first year of my contract was limited, as I still had not finished my schooling. I soon graduated high school 1year early and moved to New York at the start of 2015 eager to get my career moving forward. My career highlight so far would probably be my first trip over to Europe. I had never been outside of the United States, so when work took me to London and Paris, I was so beyond excited. Have you travelled overseas ? If so, where? I have only traveled to Europe and a few Caribbean islands so far. I have been to London, Paris, St. Barth’s, and the Virgin Islands. I must say traveling is the best perk of modeling in my opinion. Where is your favourite place to model? My favorite place to model is on the beach, of course?! There can be so much variety on set at the beach shoot and I’ll never turn down a day in the sun. You're from Dallas, Texas. Is there much of a fashion industry there? What is it like? I am from Dallas, Texas…Yee Haw lol! The Texas stereotype of cowboy boots and farmland everywhere isn’t exactly how it is where I’m from. Dallas is a big city and does have a small industry when it comes to modeling, but it is very limited. There are some big commercial clients like JC Penney and Dillard’s, but for the most part it is dominated by smaller boutique brands. I never had too much work in Dallas since my agency has no branch there, but I do know some girls back home who have found lots of success through their Dallas Agencies. You're living in New York City at the moment, what is that like? New York is absolutely AMAZING. It’s madness here and I love it. In New York, everything is so fast paced and there’s never a time with nothing to do. I’ve been here for a year so far and I wouldn’t mind spending many more years here. The work opportunities in New York for models like me are endless and the longer I live here, the more I love it. Do you find that there is a lot of competition in the NYC market? Although there are many clients in New York, with that also comes many models. The industry is very saturated and the competition is all around you. There are many amazing models at most every casting I go to. I sometimes find myself intimidated by all the competition in New York, but I always make myself snap out of it and trust that what is meant to be, will be. My dream job would be to walk in the Victoria’s Secret Fashion Show. I have always looked up to the Angels and have always hoped that someday I could be one too. I also would love to shoot an Alexander Wang Campaign because he is one of my favorite designers. My worst shoot experience….hmm…I once did a test shoot in Malibu and was shooting for hours in the ocean, which happen to be freezing. The photographer took way longer to get his shots than I feel that he needed, which only left me in the freezing water for longer. As much as I hated the entire day, I was looking forward to getting some good pictures for my book. A week later, I find out that he lost his main memory card somewhere on the beach and he had just a few photos to offer me in the end because of this…all of the suffering for pretty much nothing. My style icon would hands down be Olivia Palermo. She knows how to pull off any look from classy to grunge; she kills any outfit she wears. I would love to see her closet. My go to outfit is so cliché New Yorker. If I am in a hurry I will always throw on some black skinny jeans and a tight black top. On top of that I’ll throw on a Leather Jacket and some heeled leather booties and I’m on my way. What is the best advice you ever received, who gave it to you? The best advice I ever got was probably from my Mom. She always told me to remember where I came from and never let anyone or anything change me. So through the ups and downs of my job, I am always able to stay positive knowing that I have my family at home on my side. No matter how crazy things get sometimes, I stick to my morals and always remain myself. Do you have a signature look that clients book you for especially? What is it? So far in my career, I would say my signature look is more on the commercial side. I think clients book me for my young look and like to embrace my loud personality and turn it photos. I am very into health and fitness and it’s something that I stick to every day. I eat very clean and workout typically 6 days a week. For food, I have yogurt and fruit for breakfast, a big salad with salmon for lunch, and a piece of simply cooked fish with vegetables for dinner. I learned recently that it is so important to remain consistent in my diet. I do boxing with my amazing trainer at UFC twice a week and also meet with a personal trainer who focuses on my core once a week. On days that I am not with a trainer I run 3 to 6 miles of cardio and do a few circuits of abs and finish with a trip to the steam room. I have to work for my body so I am pretty committed to my fitness routine. As much as I would love to eat Ben & Jerry’s everyday, that’s just not the case anymore lol. I plan on modeling as long as I can. If my work continues on for many years into the future, I would definitely stick with it and do it until my journey in the industry is over. After my career ends in modeling, I would love to stay in the Fashion Industry but work on the business side of the things. I am going to school to earn my degree in business management and definitely plan on someday pursuing a career as a business professional. Probably a student at a big southern university right now, earning my degree in business. Modeling brought me to New York, but before I got scouted my plan was to always attend a big university in the south like University of Texas. If you could have dinner with anyone, alive or dead, who would it be and why? I would love to have dinner with Tyra Banks. I think she’s so amazing and I would love to ask her a few questions. She’s such a strong person and has done so many amazing things, and I would kill to hear some of her stories about the experiences in her career. Whats playing on your iPod a lot at the moment? I have been listening to Gustavia Radio on an app called TuneIn. It’s my favorite radio station and it is located in St. Barth’s only. I can listen to it through this app and I can’t stop listening. It’s a cool mix of music with lots of dance remixes and is the perfect playlist to chill out to. I never leave home with a battery backup for my phone, chapstick, and sunglasses. I have to have these to get through my day. My favorite holiday destination is without a doubt St. Barths. It’s the most amazing little island in the French West Indies. The beaches are picture perfect and the town is so much fun. I can’t imagine anyone not falling in love with this island. It’s a place that can’t even be explained and everyone needs to see it once in their life. Do you have a partner? If so, how do you cope with travelling? I have a boyfriend of 7 months now. Traveling hasn’t been much of an issue yet since I haven’t gone on any long-term trips yet, but I have definitely heard it can be hard. I guess I will see soon, but I’m pretty confident that we can handle distance if need be. What advice would you give to a model who was just starting out? My advice would be to not take anything personally, ever. No matter what the industry throws at you, keep a positive mindset. It’s not an easy industry, but it’s an industry full of unique experiences and can bring you many amazing times that you’ll never forget. I hope you enjoyed my chat with Kylie, let me know in the comments below! What is a 'Mother Agency' ? Model LifeMillicent Lambert 21 March 2016 how to find a good agency, modelling agency, viviens model management, what is a mother agency?